Sugar Ants. We get them every summer and find it virtually impossible to get rid of them. I have tried boric acid, vinegar, corn meal and an assortment of other home remedies. Nothing is working. I don’t see paying Cook’s Pest Control $40.00/monthly for a year to do this if I can find one proven way to do it. If you know of some remedies that actually work, please let me know. I've found nothing on the internet that works either. I’m at my wit’s end with these things. I bought a loaf of bread and carelessly left it on the counter. When I came back home two hours later, the bread was black with sugar ants. Any ideas, any at all. I’m beat. I have decided to go a head and have the back surgery my orthopedic surgeon has been after me to undergo. I made a blog entry last week about whether to go with it or get rid of my Honda Civic which is becoming more and more uncomfortable to drive due to my back problems. I am scheduled for surgery for July 10th. That will be exactly, and I do mean EXACTLY 13 years from the day of my first lumbar disc surgery in 1995. I’m hoping for better results this time. I never really got better after my surgery in 1995. Oh, I felt better for a few months. But, then the pain came back with a vengeance. So, I suspect my July 9th post will be my last for a while. I really dread this. But, I don’t see any real alternative right now. I have to get some relief. For those so inclined, I would appreciate any and all prayers. Rocky Raccoon is back. I saw him last Saturday night in the back yard. This is a huge raccoon who has visited my back yard for the past two years now. I know it’s the same one because Rocky has a slash just above his left eye that he must have gotten in a terrible fight. I had given him up for dead. Rocky stole peanuts out of the feeder I left for the numerous squirrels in my yard. I put a wire lock on it to keep him honest. He pulled the lock right off the feeder anyway. I made a deal with him. I left a large cache of peanuts in a small bucket just for him at night, locked up my feeder more securely. He left the feeder alone after that. 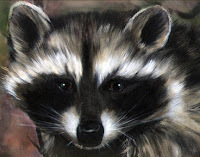 I had not seen Rocky Raccoon in over three months. Glad to see my old wildlife nemesis is doing well. Finally, I am finished buying any used computer parts off of ebay. I bought a computer power supply three months ago that has already gone out in one Dell desktop computer I have. I have bought three motherboards in the past two years from ebay and two of the three have bit the dust. I try to save cutomers money by buying used parts. And I’m sure there are people that buy good used parts off of ebay. I just have not been one of them, for one reason or another. I’m not sure why. But, unless I can find a site that will guarantee used parts at least three months, I am done buying any used computer parts in the future. In the long run, I think I’ll probably wind up saving money by buying parts new. What a great picture of Rocky Racoon. I was just outside on my land and saw a mother racoon and two babies. Not only that, I saw a mother deer with two fawns. I love living with nature. I wish you the best with your back surgery. Funny how one can get attached to something, even a raccoon if he or she sees it enough. I love nature also. I love my nature walks with my little beagle, Ralph. In fact, I did a blog entry called "Nature Walk" based on our walks together. Thanks for the best wishes on my surgery. And thanks for dropping by. I was curious about Rocky ... if, other than stealing peanuts, he posed any more of a problem. For example, has there been any agression? We had a Momma raccoon at our place last year with three babies that would come right up on our deck to lick the grease off the grill's grease trap! We tried discouraging her with fire-crackers since we were warned that racoons can be dangerous if they lose their fear of you. Well, this year we've got two mommas ... one with a little of four and the other with six! One moved into a tree within 20 yards from the house! Like you, I love nature ... and they're adorable ... but I don't want to create a bad situation either ... for us or them! Initially, Rocky would come right up on the back deck of my house. I didn't want him that close because I know what a fearsome reputation raccoons have. So, I rattled some pots and pan at him each time he came up on the deck. I did that about three times and he got the message. From that point on, he stayed at the back end of my back yard where the squirrel feeder was located. We reached an armistice by my giving him some peanuts a good distance away from the feeder. He quit going after the feeder when I did that. Plus, the wire lock was more secure and he couldn't pull it off. Wow...sounds like Wild Kingdom at your place also! Raccoons are fun to watch. But, any interaction with them will spell trouble as you pointed out. I keep my distance from Rocky Raccoon. I just like to watch him chewing those peanuts. He had been gone for three months and when I looked at the back yard and saw him, he appeared to be looking for the bucket. But, like everything else, peanuts are just too expensive now. He'll have to make do on his own, I'm afraid. Thanks for stopping by!